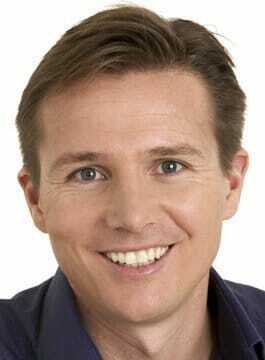 Roger Black MBE is a Legendary Athlete, Presenter and Motivational Speaker. One of the country’s most successful athletes, Roger represented Great Britain for fourteen years at the highest level. Roger was born and raised in Portsmouth and subsequently went on to read medicine at Southampton University. Admired for his triumphs over adversity, he overcame serious injuries and a rare heart valve condition to become a world champion. Roger is now recognised as one of the UK’s best motivational speakers. Roger Black won fifteen major Championship Medals including European, Commonwealth and World Championship Gold Medals. He was British Men’s Team Captain and was awarded the MBE in 1992. Roger signed to BBC Sport in 1998 and has since presented from the Sydney Olympics, World Athletics Championships, Commonwealth Games and the European Championships. In 2002, he co-presented the last series of Tomorrow’s World and in 2004 the BBC’s award-winning City Hospital. Roger Black possesses a deep knowledge of motivation and self-development. He understands the dynamics of becoming a champion, how to live a dream, set goals and take the necessary steps to fulfilling ones potential. By combining his experience of self motivation and attainable personal development, both on and off the track, he motivates organisations around the world. Roger’s most popular speech motivates delegates to become more successful as an individual and as a team member. He tells the story of his career using anecdotes to demonstrate how the fundamentals were learnt. The dynamics of teamwork are described through the story of the World Championship winning 4x400m relay team of 1991. The belief that the greater good of the team is more important than any individual ego. Roger’s speech is both thought provoking and entertaining. "Roger was an excellent guest speaker and leads the way in style and content. He held the audience's complete attention with inspirational messages on achieving potential on both a business and personal level. There was something for everyone and his interaction with delegates was much appreciated." "The feedback has been fantastic. You managed to be both entertaining and highly relevant - no mean achievement given we had around 45 nationalities represented!" "We have quarterly events and the majority of the feedback has been that Roger is the best speaker we have had!"